German Economy Minister, Peter Altmaier, arrives for the weekly Cabinet meeting of the German government at the chancellery in Berlin, Dec. 12, 2018. 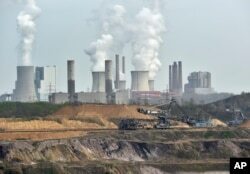 FILE - Machines dig for coal in front of a smoking power plant near the city of Grevenbroich in Germany. Germany's economy minister says one challenge of the future is sustainable energy.